In this greatly expanded edition of his international bestseller, Andreas Moritz reveals the most common but rarely recognized cause of illness – gallstones congesting the bile ducts in the liver. Besides leading to gallbladder diseases and gallstone attacks in at least 20 million Americans each year, in many cases, liver bile duct congestion sets the stage for even more serious, seemingly unrelated, conditions, including obesity, diabetes, heart disease, and cancer. 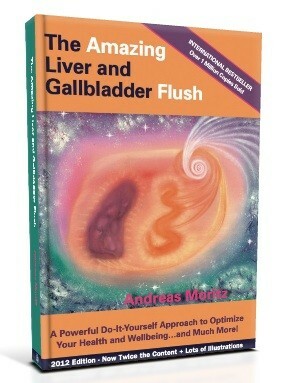 The Amazing Liver and Gallbladder Flush By Andreas Moritz In this expanded edition of his international bestseller, Andreas Moritz reveals the most common but rarely recognized cause of illness – gallstones congesting the bile ducts in the liver. Besides leading to gallbladder diseases and gallstone attacks in at least 20 million Americans each year, in many cases, liver bile duct congestion sets the stage for even more serious, seemingly unrelated, conditions, including obesity, diabetes, heart disease, and cancer. Most adults living in the industrialized world, and especially those suffering a chronic illness, such as irritable bowel syndrome, heart disease, arthritis, multiple sclerosis, cancer, or diabetes, have in fact hundreds if not thousands of gallstones (mainly clumps of hardened bile that escape detection for they are invisible to x-rays, ultrasound, and CT scans) blocking the bile ducts of their liver. This book provides a thorough understanding of the liver and its complex functions, what causes gallstones in the liver and gallbladder, and why these stones can be held responsible for the most common diseases so prevalent in the world today. It provides the reader with the knowledge needed to recognize these stones and gives the necessary, do-it-yourself instructions to painlessly remove them in the comfort of one’s home. Packed with images, the book also gives practical guidelines on how to prevent new gallstones in both the liver and gallbladder. The liver and gallbladder flush (cleanse) has led to extraordinary improvements in health and wellness among millions of people who have already given themselves the precious gift of a strong, clean, revitalized liver. Besides providing the practical procedures to cleanse the liver, gallbladder, kidneys, and intestines, Moritz explains in great detail the origin of all types of common diseases and how to prevent or reverse them naturally. The book is packed with precious, time-tested approaches designed to return the body to a permanent state of balance and vitality; it includes a complete program of healthcare, which is primarily based on the ancient medical system of Ayurveda and the vast amount of experience Andreas Moritz has gained in the field of health restoration during the past 30 years. Moritz is the author of 15 groundbreaking books on natural health and a leading, internationally recognized, authority in the field of integrative medicine.